This past weekend one of our wonderful guests was so excited to be checking into one of our rooms for the next 2 days. We were discussing the upcoming events for the weekend including the much anticipated Oakwood Cemetery tours. After breakfast the next morning she told me about a book that her friend wrote about Jefferson. The book was a small printing and she said that not many copies were printed; well I was intrigued for sure. Just before they headed out for the day she handed me the book…. It’s called Love’s Timeless Hope written by Anne Meredith, it’s a bit of a romance novel and so far I love it. The book is about a romance novelist who decides to go to Jefferson Texas to do research for a new novel. She is intent on trying to make sense of Jefferson’s bewitching legends. 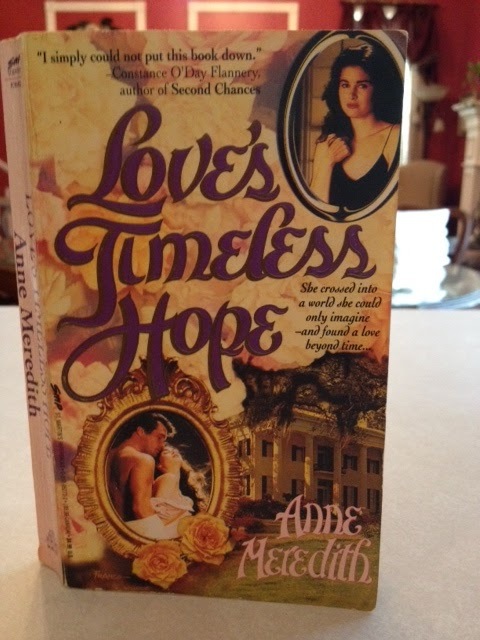 When she checks into a historic bed and breakfast everything changes and she is swept into the past. After a tour of the home by the Innkeeper she relaxes with a glass of wine and then finds herself in the year 1876.. I will be posting a review when I finish this book, which with the speed of my reading should be about a week. I’m such a slow reader. 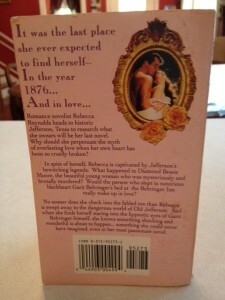 This entry was posted in Books by Tammy D. Bookmark the permalink.